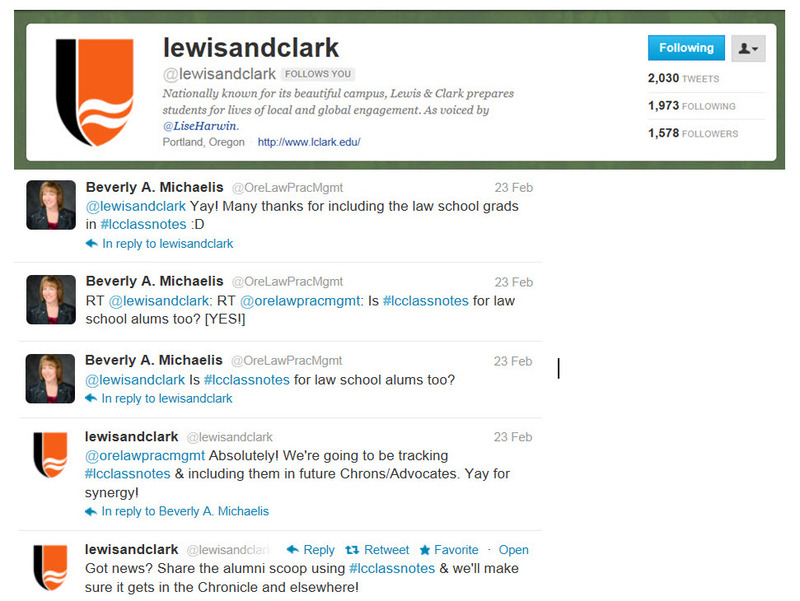 If you’re a graduate of Lewis and Clark Law School, consider following @lewisandclark on Twitter. Use the hashtag #lccclassnotes to share alumni news. Posts will be included in The Advocate for law school alums or The Chronicle if you’re a graduate of the College of Arts & Sciences. At the present time, there is no Twitter account specifically for Lewis and Clark Law, but I wouldn’t be surprised if that changes soon. This entry was posted in Career, Social Media and tagged alumni, Beverly Michaelis, Career, Law Practice Management, lccclassnotes, Lewis and Clark College, Lewis and Clark Law School, Oregon law practice management, Twitter by beverlym. Bookmark the permalink.